Ever have that feeling when you see something so nifty, and simple that you wish you’d thought of it? That was me when I saw this very creative communications strategy template from Sarah Yates, Broxtowe Borough Council’s brilliant Corporate Communications Manager. I love it because it educates non-comms people about the process we go through (no we don’t just pretty things up! ), and having it on the wall can help you set expectations for your colleagues about how they can work with you. 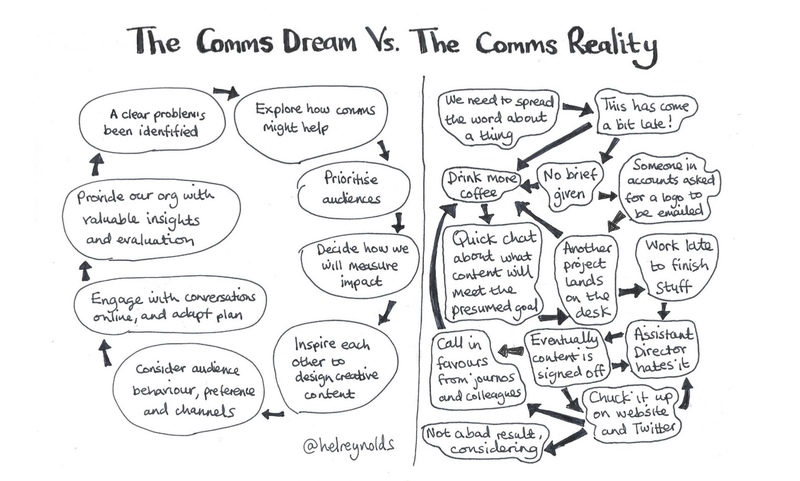 Also, it’s a quick guide for new comms colleagues, and anyone who wants to create a communications strategy. “As a massive ophidiophobe (read: snake scaredy-cat), creating a useful comms tool covered in pictures of them, albeit cartoon ones, wasn’t exactly part of the plan. It all started when we were developing our new Communications and Engagement Strategy. The strategy is accompanied by a toolkit for staff which gives them useful guidance on getting started with communications, what to think about and what we need as the Communications Team to support them. As part of the toolkit, we created an ‘Are You Comms Ready’ flowchart to show the steps to take before you reach the Communications Team with a request. The problem was, it was just another flowchart and if we really wanted people to follow it, we needed to do something different with it. That’s when we had the idea to make it in to a board game. Me and my colleague Richard banded around just about every board game under the sun but nothing quite fitted. Being the obsessive I am, I went home that night, did a bit of googling and stumbled on some snakes and ladders themed primary school teacher aids, which seemed like it might work. Several scribbles and screwed up bits of paper later and I arrived in my Design and Print Officers Office and made my request. If you ever want to question your own sanity, ask someone to design communications themed game of snakes and ladders. After the initial strange looks, he agreed to come up with something for me and a couple of days later the first draft landed in my inbox and I realised I wasn’t mad – it actually worked. Fast forward a few months and having had some really positive comments from our Senior Managers and other comms colleagues, the communications strategy was approved, along with the toolkit and game. It’s too early to tell if it’s going to reduce demand coming in to the Comms Team by forcing people to really think about their comms before they ask us any one of the 15 things comms teams hear every week, or if it will improve the quality of brief given to us but we’re looking at how we can measure this and hope to report back on it next year. Thanks again Sarah – this is a fabulous piece of #CommsCreative. Need help with your social media and comms? Get advice and inspiration straight into your inbox. Includes access to the monthly newsletter and updates on Social For The People training and offers.